When first looking at the history of Rev. McNair’s 31st New Jersey Regiment, one notices that they are only remarkable in that their nine months of military life passed without a major battle or an interesting story to tell. Even my history professor at the University of Washington Genealogy Certificate program told me I could give it just a cursory mention in my paper about Rev. McNair. Inglorious, huh? The authors of the History of Hunterdon and Somerset Counties thought the 30th and 31st Regimental histories were so similar and “vanilla”, that they combined them so as to not have to waste too much paper on the tediousness. They left New Jersey on 28 Sept 1862 to travel to Washington D.C.
For two months, they camped at Tennalytown, DC where they “engaged in picket and other duties”. They were attached to Casey’s Division protecting Washington D.C.
On 1 Dec 1862, they traveled to Aquia Creek, VA and later to Belle Plains, VA to do guard and provost duty until early January – attached to Patrick’s Brigade, Army of the Potomac. And yet, even though the Regiment of 1016 men did not fight in any battles, might not they still have a story to tell? Elizabeth Shown Mills suggests using the FAN method (Friends, Associates and Neighbors) to understand our ancestor’s experience and connection. If I look at the records of these soldiers who served in the same Regiment as Rev. McNair, what might I learn about his experience as their Chaplain? 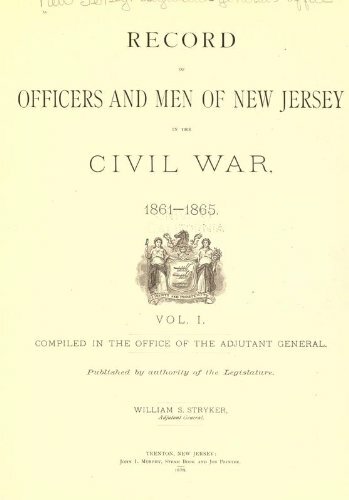 Luckily, there is a published resource of all the men who served in the New Jersey Regiments during the Civil War. I was able to extract all the names of men who died or were disabled during their short time in the Army. Even though they weren’t in any battles, the duty was dangerous for many; 40 of them died and 36 were discharged with some type of disability – over 7% of the Regiment. 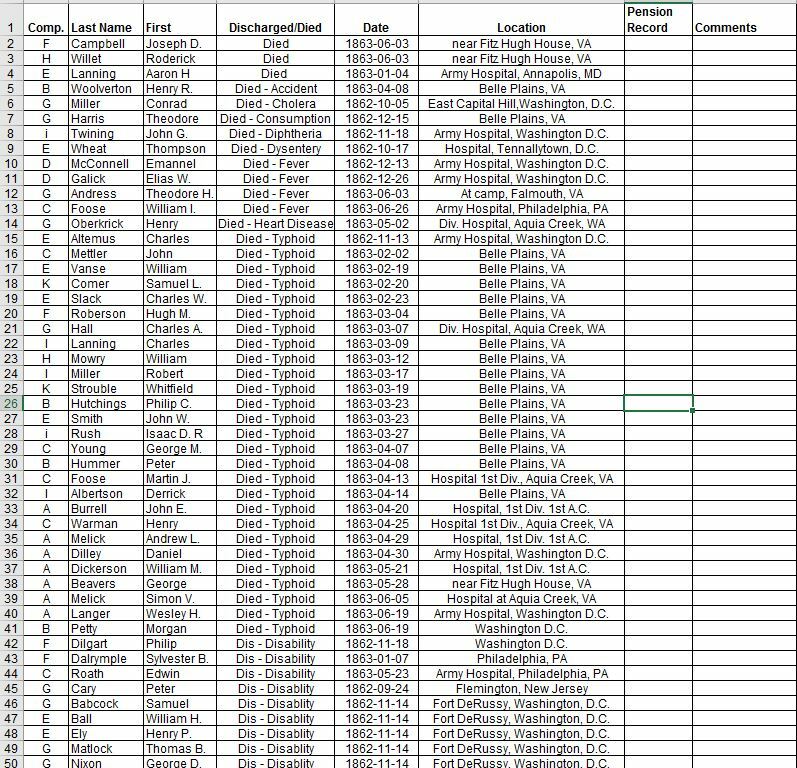 I used an Excel spreadsheet to be able to sort and look at the data differently. Reviewing the data by cause of death, a different kind of story starts to emerge. Typhoid was the number one killer with a smattering of other diseases like dysentery, diphtheria, general “fever” and cholera; picket duty when done in cramped and unsanitary conditions could be treacherous. When looking at the fallen by discharge or deceased date, you are able to somewhat follow the Regiment’s movement and see what it must have been like to have your comrades fall around you almost on a daily basis. The next steps are to look at the pension records for these men to see if they give more details about the camp, their illnesses and what the Regiment was doing in more detail. I believe that Rev. McNair would have been visiting the hospitals if they were close to the Regimental camp to minister to the sick and dying. There is a tiny chance he might have written to the family and that it would be enclosed in the pension file or he was mentioned. I need to expand the search more and look at all who served in the Regiment and perhaps they left a diary or letters? Yes, I must get more background of this pivotal experience. Even though they weren’t in any battles, there was suffering, they participated in long marches, they provided service to their country and many gave their lives for the cause. This entry was posted in Civil War, Civil War Pensions, McNair Family and tagged New Jersey 31st Regiment, Rev. John McNair. Bookmark the permalink. Wow! Nice use of data analysis. Is it hard to know where to stop with FAN?. Looking up all the records could be very time consuming. Of course, maybe just a few would give you a good picture. Yes, it is hard to decide how far you want to go for a story that isn’t necessarily going to add more facts about your ancestor, but is just making a broader more interesting tale. However, you must use the FAN method as far as it will go to prove a family connection when you have few records. I just watched a webinar with Elizabeth Shown Mills from the May NGS Conference on her use of FAN on a question/project that she has over 1000 hours into and she isn’t done! What an interesting way of analyzing and finding the “story”. Thanks! It is quite rewarding when patterns emerge and suddenly you realize something else is going on.